Interstate 75 was recently shut down on both the northbound and southbound sides due to a serious pileup in Charlotte County, according to My Sunny Coast News. Multiple trauma patients were airlifted by helicopter to local hospitals. While 14 total people were injured in the pileup, which involved a rollover, five were left in critical condition. Another fatal rollover collision occurred in Martin County, when a male driver rolled his car in a single-vehicle crash. After rolling over, his vehicle was smashed by a dump truck, as reported by WPTV News. A third rollover involved a car and a semi-truck carrying sand in Charlotte County. According to My Sunny Coast News and initial police reports, a car that was stopped at a flashing red light intersection pulled in front of the approaching truck, which had a flashing yellow light through the intersection. The truck collided with the car and rolled over into a ditch. A rollover accident is usually the result of high speed and a “trip.” A trip is any object or substance that causes the vehicle’s wheels to jut out, causes the tires to lose temporary traction, or causes the car to veer sideways. Common “trips” are sidewalk curbs, loose gravel on the side of the road, a median, a ditch or culvert, a tree, another vehicle, a raised road infrastructure, or fallen cargo from a truck. As speed increases, even a small trip can send a car or truck rolling. Most commonly, rollovers occur when a driver is not paying attention, likely from looking down at their phone, then looking up at the road to see that they have veered into the wrong lane of traffic or are heading towards the curb. The next response is to correct their trajectory, which often ends in over correction and an even more sudden veering in the opposite direction. At that point the vehicle may hit a loose patch of gravel or dirt off the edge of the road (the trip), and then roll. It is very rare that a driver of a passenger vehicle will simply take a corner too fast and roll over without hitting something that causes the initial tipping. Semi-trucks, passenger vans, and SUVs are much more prone to rollovers than typical passenger vehicles such as sedans or mid-sized vehicles. 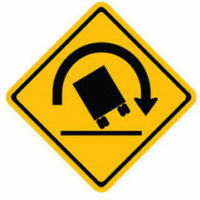 Semi-trucks commonly rollover when they approach a corner too fast, lose their brakes on a descent, or when the driver falls asleep at the wheel. The higher the center of gravity, the easier it becomes to lose control and cause a rollover, which is also why passenger vans and SUVs are more likely to rollover than lower-to-the-ground cars. Rollover collisions are among the most dangerous and fatal of all traffic collisions. If you were involved in a multi-car rollover or pileup, ascribing negligence to the correct party can be complicated. Contact an attorney for more information on how to recover the financial compensation that you deserve. Call the Celeste Law Firm in West Palm Beach today at 561-478-2447 for assistance with your case.